While the national headlines this week are preoccupied with the return of a certain basketball star to Cleveland, sports fans in Ottawa have the return of a different star on their radar. Ottawa Senators fans circled the date on their calendars when the NHL released this year’s schedule: Dec. 2- Dany Heatley’s return to the nation’s capital. The San Jose Sharks arrive in Ottawa for a game Thursday evening, and it will mark the first time the all-star winger steps on the ice at Scotiabank Place since he demanded a trade from the Senators. The normally subdued Ottawa crowd will turn up the volume every time Heatley steps on the ice or touches the puck, reminding him of their displeasure. It is the second time this week that a former Senator returned to Ottawa; former Sens goalie Martin Gerber backstopped the Edmonton Oilers to a 4-1 victory on Monday evening. Heatley’s return, however, will merit more of a response than Gerber’s trip to Ottawa with the Oilers. Two years into a seven-year deal, Heatley demanded a trade from Ottawa. And with a no-trade clause in the contract, he was in the driver’s seat, limiting GM Bryan Murray’s options. A possible trade to Edmonton was vetoed by the Heatley camp, which did not sit well with hockey fans in Alberta. The deal with San Jose was eventually worked out. 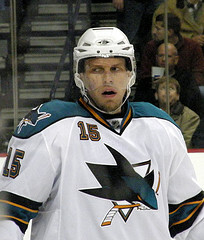 Heatley and a fifth-round draft pick went to San Jose in exchange for Jonathan Cheechoo, Milan Michalek and a second-round draft pick. With Cheechoo out of the league and Michalek looking for his top gear after off-season knee surgery, San Jose certainly got the better deal in the trade. It remains unclear what exactly went wrong in Ottawa, but it appears a less-than-ideal relationship with head coach Cory Clouston was one issue, and rumors of problems with the Ottawa media appears to have fuelled the trade demand as well. Heatley is off to his usual great start this year, leading an underachieving Sharks team in scoring with 12 goals and 13 assists. San Jose is in unfamiliar territory 23 games into the season, sitting in 11th place in the Western Conference with an 11-8-4 record. Ottawa is the first stop on a five-game road trip for San Jose, and Heatley would love to begin the trip on a winning note with a few goals against his former team. In an Ottawa Sun interview, Heatley’s agent JP Barry told Bruce Garrioch that his client is prepared for a chilly reception in Ottawa. Lost in the shuffle with Heatley’s return to Ottawa is the fact that the Senators continue to struggle offensively and are desperately in need of some consistency and a winning streak. The team has lost seven of their last ten games and have allowed 33 goals during that stretch (they have scored 17 goals). While the attention of the Ottawa fans is focused squarely on Heatley, the Senators players must prepare for an entire team. Failing to do so will only make the climb back into the top eight in the Eastern Conference that much more difficult.